Boxing Day is one of the most famous dates of the English football calendar. After the festivities of Christmas Day, football fans watch their favourite sides play and hopefully continue the Christmas cheer. For Manchester City, there have been ups and downs on Boxing Day, like any other club. Here are seven mood-boosting wins for the Blues since the 2008 takeover. On this day in 2008, Robinho and Felipe Caicedo scored two each and Stephen Ireland the other as City thrashed Hull 5-1 at the City of Manchester Stadium. 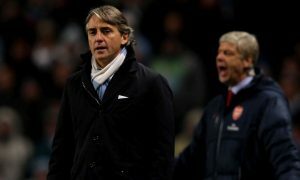 On this day in 2009, the Roberto Mancini era began with a 2-0 win over Stoke at home. Martin Petrov and Carlos Tevez scored the goals. On this day in 2013, City won an exciting match against Liverpool, coming from behind to win 2-1 thanks to goals from Vincent Kompany and Alvaro Negredo. On this day in 2014, City survived a snowstorm as they beat West Brom at The Hawthorns, with Fernando, Yaya Touré and David Silva finding the net in a 3-1 win. On this day in 2015, four different players – Sterling, Touré, Bony and De Bruyne – found the net as City thrashed Sunderland 4-1 at the Etihad. On this day in 2016, City climbed to second place in the Premier League as Yaya Touré and Kelechi Iheanacho found the net in a 3-0 win at Hull.